Your LinkedIn profile is an important piece of your professional branding. LinkedIn combines the professionalism of a digital resume and the interaction of a social media platform. It doesn’t matter if you are fresh out of college looking for your first big-kid job, a seasoned professional scouting to recruit new employees, or a business targeting potential customers- LinkedIn is a place for every professional. As an individual, LinkedIn allows you to market yourself in a professional setting. 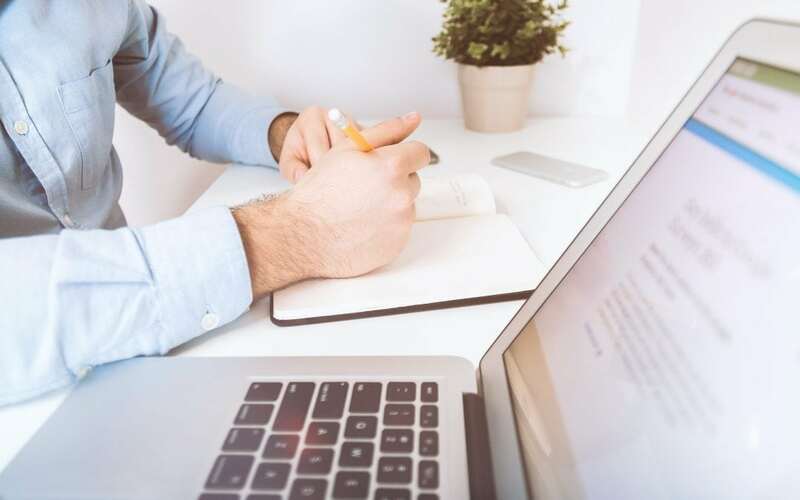 With your personal LinkedIn account, you will be able to connect, interact, and learn from an array of professionals across a huge spectrum of fields. It is also important (and necessary) for business owners to have a personal LinkedIn account. As a necessity, you must first have a personal page before you can create a company page. Beyond that, it is smart to leverage your personal page to help promote your business page. You can share posts from your company page to your personal page, which is a great way to expand your reach and grow your following. We recommend that employers ask their employees to do the same! Follow these steps to get set up with an impressive LinkedIn profile that will help get you noticed in the professional world. Pro tip: Before filling out your profile, take a minute or two to write down a few words and phrases that you want to connect to your profile. Your LinkedIn profile is searchable on other search engines so keywords are important here (e.g., graphic design, real estate, electrician, programmer, etc). The more places you can put the words that define you and your business, the better. Join LinkedIn. 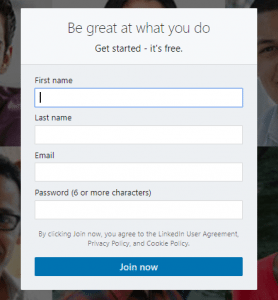 Go to www.linkedin.com to begin setting up your profile. Simply fill out the form fields and click “Join Now.” The next few steps will allow you to enter personal information to populate important fields on your profile page. 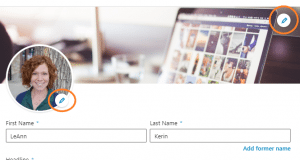 Upload a professional photo of yourself. Make sure it is a recent picture and looks like you. LinkedIn recommends that your face take up 60% of the photo, and you should wear what you wear to work. First impressions matter, even on social media. If you don’t have a professional headshot, consider adding that to your to-do list. Add a background photo. This is the secondary visual element on your page and helps your page stand out. Choose something that represents the industry you work in, or another photo that is relevant to the message you want to send. truncated) – this will show up next to your name everywhere on LinkedIn. You might be tempted to simply add your job title here, but try to think outside the box. This is a great place to tell people what you do by plugging in some keywords and phrases. Avoid titles like “Owner” and try to use a description of how you add value or what you do. Think about what you have to offer, what makes you unique, what value you bring, and how you can help. It is always easy to change, so don’t worry about getting it absolutely perfect the first time. Fill out the summary! So many people skip this section, but it’s a chance to really give your profile some personality. Don’t just list bullet points of your skills- turn your skills into a story. Explain why your skills matter; bring your skills to life! Be sure to include a link to your website (if you have one) under the websites section. You can change the “title of the website” that shows up on your profile. Often times people won’t change that and all you will see is a link to “Website”. Edit the “‘Name” and call it something like “Aspen Grove Marketing Website” or something more descriptive. Public Profile Section (just below where you list your website – click “Edit”)– this is the section that allows you to change your “Privacy Settings.” Your LinkedIn profile is searchable on LinkedIn as well as other search engines. We have ours pretty open because we want to show up in searches and we want people to be able to see what we have done and see our recommendations, even if they aren’t connected to us. This section also allows you to choose a custom URL (e.g., www.linkedin.com/in/leann-kerin). Add positions like you would in your resume. Fill out the position descriptions fully and try to include some of the keywords and phrases. Think about what you would tell a potential client. A little more than an elevator speech but not a novel. Highlight success stories or problems solved as well. If you are a business owner, you can create a company page and include information about job postings etc. Make connections. It is good to work on growing these. When you send connection requests or ask for recommendations, ALWAYS personalize the message. DO NOT leave the standard “I’d like to add you to my professional network” bit that LinkedIn pre-populates for you. If it is someone you may not know as well, tell them how you know them and why you would like to connect. Start asking for more recommendations. Recommendations are written by other LinkedIn members as a way to recognize or applaud each other. Start by asking for a couple now and a couple in another month or so. You want to have fresh recommendations (at least some within the last 6 months). Always personalize the request. Do not leave it the standard that LinkedIn puts in. If you feel comfortable with it, you can give them some ideas or guidelines about what you are looking to highlight. Use your status updates to let people know what you are doing and if you are looking for partners, members, or clients, etc. These are your professional connections, and this is the place to leverage them. Congratulations! You have just created and populated a LinkedIn profile. Now you can connect with people and stay up to date on happenings in your professional network. Continue to check in on your LinkedIn profile and keep it up to date as well, and continually work to grow your connections and recommendations. 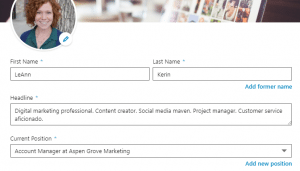 Now that your personal LinkedIn profile is set up and complete, you can create a business profile! The power of your LinkedIn profile is a strong as you make it. It is important to write about yourself in a detailed, professional, and confident way. We’ve heard some people say they aren’t comfortable writing about themselves in this way, which we completely understand. If you’re one of these people, we can help. We can help you optimize your profile, manage your content, and get your page seen by the right people. Contact us to learn more about the full range of services that Aspen Grove Marketing provides.